When people consider Robin Williams’ top performance, “Good Will Hunting” and “Dead Poet’s Society” likely dominate their list. In the film, Jeff Bridges plays radio deejay Jack Lucas. Famous for his insulting behavior, Jack’s attitude gets him in trouble when a depressed caller takes the lives of himself and seven strangers. Years after losing his job, Jack is tormented with guilt and disgrace. Contemplating suicide, Jack is rescued by a demented homeless man named Parry (Robin Williams). Parry searches Manhattan for what he believes is the Holy Grail. Overcome with responsibility and a chance at redemption, Jack decides to assist Perry with his ludicrous quest and help win over the woman he admires. Mercedes Ruehl plays Jack’s encouraging girlfriend, Anne. Amanda Plummer plays Lydia, whose clumsy, childlike behavior leaves Parry smitten. Ruehl’s attitude and Plummer’s gullible innocence are traits both actresses present with attractiveness. Directed by Terry Gilliam, he creates a New York City dwelling with homeless folk cursed by poverty and mental disorders. Their unhinged sanity and contentment towards life is believable and hilarious. “The Fisher King” doesn’t try to solve the concerns of poverty but reminds us homeless people are people too; a fact society tends to ignore. Following Lydia through a train station, Parry becomes overwhelmed with affection and witnesses travelers ballroom dancing. This scene generates a sensation of radiant awe. Weaving in and out of their path, Parry’s fantasy demonstrates how a fascinating clutter can be found in something remarkably unattractive. Jack helps Parry only to feel better about himself, not because he genuinely cares. But for Jack to be truly redeemed he must become selfless and earnestly love Parry. 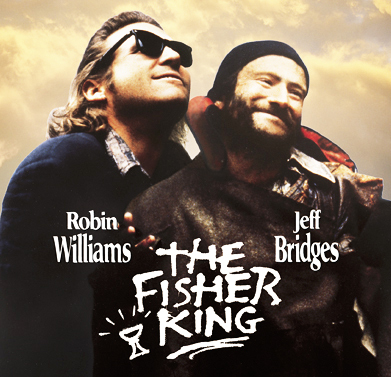 The Fisher King is available on Netflix and I recommend it to anyone who hungers for a great story.